Welcome to my blog! I've done a lot of traveling this year and this summer is full of more days away from home. So I decided to highlight my favorite form of transportation. I also had some family members that visited this weekend and I thought that this week's theme gave me the inspiration to the card I am sending them off with. This week's Heart2Heart Challenges theme is "Transportation", says a lot doesn't it? 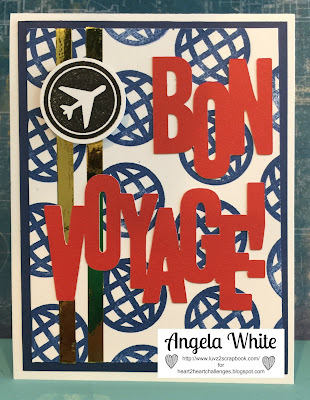 I created a Bon Voyage card using the "Sight Seer" stamp set along with some Sapphire Ink and card stock. I love using stamp images to create my own background and I thought that the globe image is the perfect element for my card.